Shown during the Celebrate Excellent Care recognition are (l-r) Dr. Robert Portz, Tanya Crawford, Jean Winstead, Kate Mangion and Bonnie Cunningham. Healing doesn’t always happen the way it should. After weeks of a difficult surgical site recovery, I was referred to Beebe Healthcare’s Wound Healing & Hyperbaric Medicine. I already knew firsthand how amazing this Beebe service is as I have worked with them for years. I am currently the health sciences librarian for Beebe Healthcare, and I provide evidence-based healthcare articles and assistance as needed. Based on a skin cancer procedure I had in September, my healing was directly impacted by the surgical site being close to a metal plate, six screws and a bolt in my left ankle from a previous injury and surgery. Edema management in that area of the leg was difficult, and even after some treatments in early December, the healing was hindered. The physician referred me to Beebe Healthcare’s Wound Healing & Hyperbaric Medicine so they could incorporate best practices and products to promote successful wound healing. On Dec. 17, 2015, I contacted Bonnie Cunningham, GCNS-BC, CWOCN, director of Wound Healing and Hyperbaric Medicine, who offered support, guidance and comfort. The following Monday, Dec. 21, my healing journey began. The journey was not an easy path - weekly treatments, multi-layer compression wraps, and some tears were all part of the process. But twice a week I arrived to find dedicated nurses, medical technicians and the front desk staff ready to encourage me back to great health with extraordinary care and compassion. Wound healing is a complex process, and it didn’t happen overnight the way I had hoped. It took approximately 12 weeks (actually 78 days), and on March 7 (yes, seven is a lucky number), I graduated! I was the first patient to graduate from Beebe Healthcare’s new location for wound care at the Medical Arts Building on Route 24. I will forever be grateful to this amazing team and want to recognize all of them. I have to specifically thank Kate Mangion, my nurse practitioner, who provided excellent care and comfort, as did Medical Director Dr. Robert Portz, who greeted me on my first day of assessment and assured me I would heal. He was right. Nurse and longtime friend Tanya Crawford encouraged me and reminded me I would get there. This team that I have had an opportunity to work with for years helped me succeed. How fortunate we are in Sussex County to have Beebe’s Wound Healing & Hyperbaric Medicine, which provides excellent care. 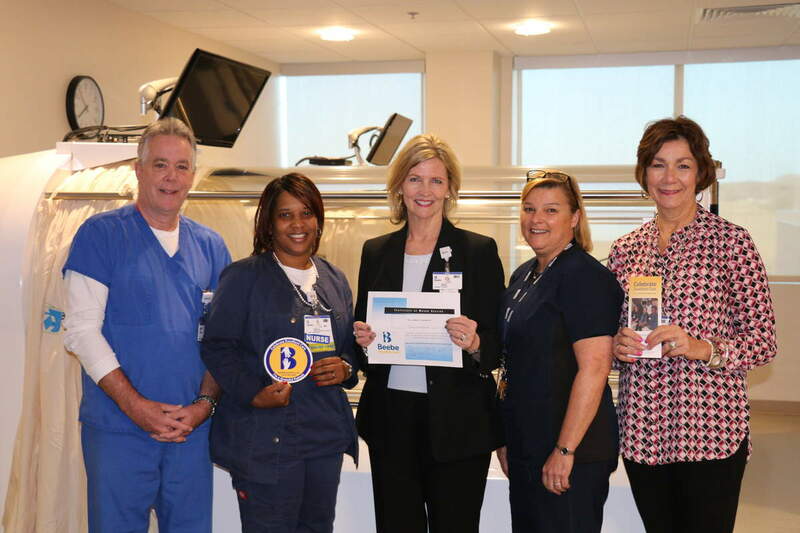 Recently, with support from the community and a great gift from Beebe Auxiliary, Beebe Healthcare was able to purchase two hyperbaric oxygen therapy chambers. This cutting-edge equipment will help heal wounds more quickly. I made my donation not only because I received excellent care, but because I want to support the growth of this program. I know my donation will help Beebe purchase more cutting-edge technologies and in turn help others heal and save lives. Thank you to everyone who is part of this team! Bonnie Cunningham said, “Chronic, non-healing wounds are an issue in almost all areas of medicine. Problem wounds caused by vascular disease, trauma, necrotizing infections, or radiation injury are regularly seen in physicians’ offices. It is not uncommon to encounter patients who have had a wound for months or even years, who have been regularly treated by their primary physician, yet the wound persists. Thanks to the generosity of our local community and Beebe Auxiliary we have added two hyperbaric chambers to our arsenal of tools for treating wounds." As a community-owned, not-for-profit healthcare system, Beebe continues to depend on the generous support of individuals, corporations, businesses, and private foundations. All gifts, large or small, to Beebe Healthcare, are tax deductible and are channeled through Beebe Medical Foundation. Consider making a gift today and share amazing personal stories with the community. To learn more about how to Celebrate Excellent Care, contact Beebe Medical Foundation at (302) 644-2900 or write to foundation@beebehealthcare.org.